Cloud 9 instructor, Sarah Crumb, proposed to her 9 - 12 year old art students that they could do a mural on one of the walls of the kids’ studio. They could pick any theme they wanted. 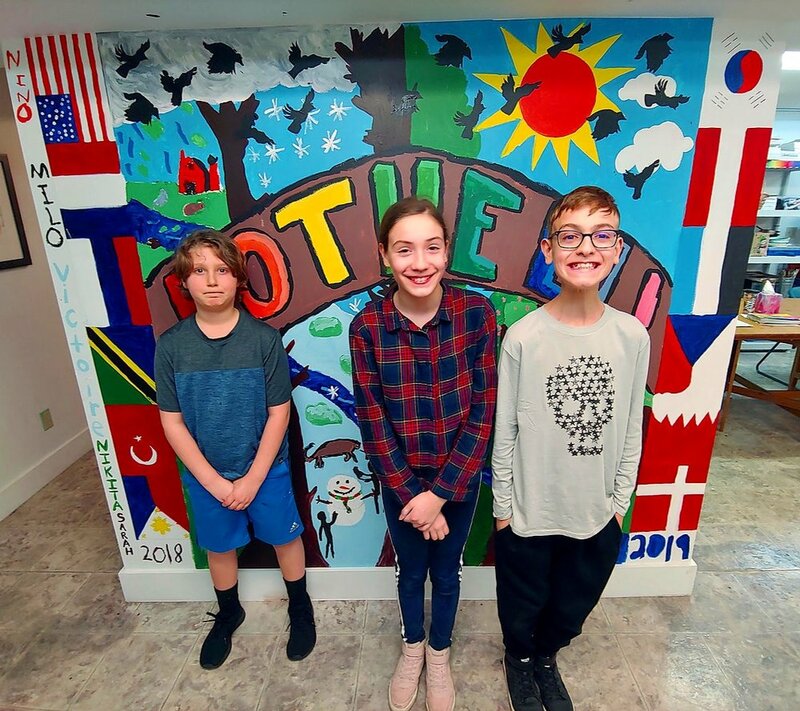 After considering some of the possibilities… (animals, forests, unicorns, outer space, Harry Potter)… the kids unanimously voted to do a mural honoring the city of Bothell. And we couldn’t be prouder! Long, long ago in November, my class of 9-12 year old students and I began the lengthy process of studying murals in order to create our own inside our classroom space. 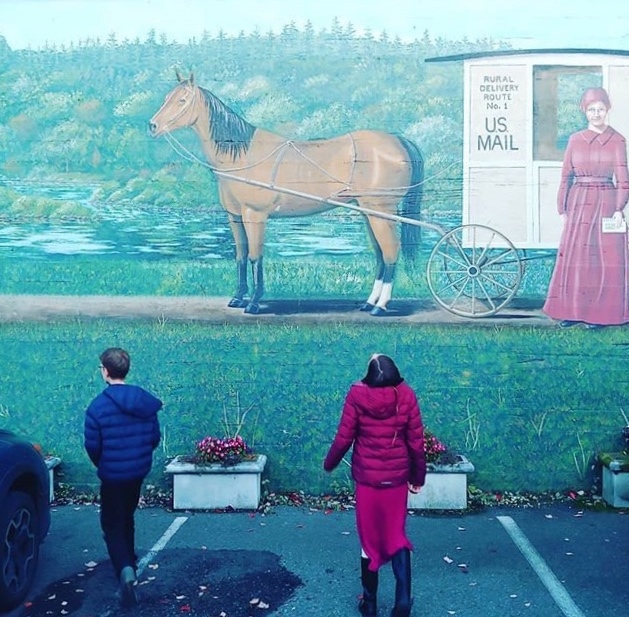 We started this adventure by looking at photos of murals within the Seattle area, then we took a walk through downtown Bothell to examine and discuss our local public art. The kids were fascinated and loved checking it all out! On our walk, we looked for and chatted about the meaning behind the murals. Most tended to tell a story of the history of the city, but some were purely there for artistic reasons. We discussed which we preferred, and returned to the classroom to begin the planning process. The kids immediately settled on wanting to make a mural dedicated to Bothell, and right away figured out the overall plan. We decided to divide the workload, and each student was assigned a personal interest or strength to be in charge of, as well as ultimately designing an entire portion of the mural. They were so excited and couldn't wait to get painting on the wall. It became a study in patience for them, as we didn't get to painting until MUCH later. But it was worth the wait. They were so excited when the time came. Please enjoy the gallery of process photos as my students really gave it their all and created a beautiful piece of work. The kids' concept for this piece was to depict the four seasons in Bothell. You can see each season fall, winter, spring, and summer starting from the left. Each season is separated from its neighbor by a tree, and each includes an animal or two that you might encounter in our area. The flags were chosen by the kids, and include nationalities of themselves, as well as flags that were pleasing to their eye. We had represented specifically USA, France, Russia, and South Korea. The bridge that can be found at the Park at Bothell Landing is represented by the suggestion of a bridge shape, containing the name BOTHELL! As a crowning figure to the scene, a murder of crows flies overhead, a fitting tribute to the nightly migration in Bothell. Each child that was part of the creation process has their name written on the side of the mural, and it is dated 2018 and 2019 to honor the two years it was created in. As a final touch, we decorated the corner with colorful handprints. If you are interested in visiting our colorful Bothell mural, it is located in the basement of Cloud 9 Art School located at 18414 103rd Ave NE Bothell WA, in downtown Bothell. Someone is often onsite, but you can also email me at sarah.j.crumb@gmail.com to set up a time to come see it in person. It's really something to be proud of! Welcome Rhonda Gardner and Color Pencil for Beginners!